With all due respect Roxstar, I think you might have caught some radio wave interference and not what you had hoped. There are distinctive characteristics with EVP/AVP that tend to fall below that of the human voice frequency of 450-8000Hz and this comes in on the spectral at 732 Hz. Also, EVP/AVP have very flat vocal banding typically and this is much broader broader variations much like a fossil resembling that of a human. 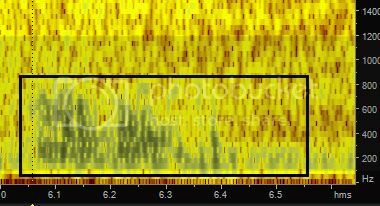 I examined this in Adobe Audition and to date, it's the only one I know that shows the frequency spectrum in audio applications. If you have a pair of recorders, and you record at the same place and you have both pick the same anomaly up, it's a much better chance it's radio wave interference. It's very common nowadays with the plethora of bombardment from cell towers, short wave, am, fm ham radio. Edited by EVP, 09 June 2016 - 03:03 PM. Were you asking any spirits around that area the question in the recording clip? I heard the name "Kevin"
Edited by Hudds, 09 June 2016 - 03:01 PM. Great analysis EVP I know you're very experienced in the field, and I respect your opinion. Chalking it up to the personal experience at hand though, I believe it was a great coincidence that the response happened when it did. There's a longer version of the events that took place before that voice came into play, i was commenting on it a lot and then bam, there it was. Here is a longer, un-edited version of what took place previously and leading up to it https://app.box.com/...s0uduu7l40s5dpd Hudds, I was not directly asking anything, just documenting what I was seeing at the time. A human voice can actually cover a range of 80 Hz to a peak in the 1-3 kHz frequency region, which rolls off quickly after that, and most of the vocal/ speech low energy is around 125 Hz a male's voice in particular. Edited by Hudds, 09 June 2016 - 03:46 PM. Roxstar, thank you for your words. I was reluctant to say after I made the analysis. I appreciate your maturity and the respect. I will listen to the other clip. Just a couple of things I noticed. Thank you for upping the unedited version in PCM wav. It looks like it was sampled around 15,000Hz in stereo as well with a fairly low noise floor.. Most don't offer that and that earned high marks.with me. Props to you sir. It made the analysis veery easy to work with..
Edited by EVP, 09 June 2016 - 04:04 PM. Hudds, I was not directly asking anything, just documenting what I was seeing at the time. I find it very odd to be anything other than a actual response to your documenting, as the response came in a second after you spoke. Roxstar, thought I'd show you what I see in the spectral. The first one is your voice and the second one (in the box) is the voice your heard. When I sampled for frequency it used the peak at the start of the syllable. That is how I derived the 732. It's not always accurate because it requires freezing it within the first millisecond to determine the frequency..EVP/AVP tend to look like a flat brush stroke but it can be tricky when the capture is weak and there are always exceptions. Some captures are above 20,000 Hz but they are rare. I've only seen a couple start above 20,000 Hz. That's why it's always best to sample high. Edited by EVP, 09 June 2016 - 04:49 PM. No problem EVP I always give respect and take every possibility seriously. I appreciate all that take the time to analyze, listen to, and view any possible evidence that anyone brings forward with question, after all, that's why we're here I wasn't able to document any of the names in the area, but I do know the exact spot where I was ( I took pictures, too) So I will definitely be returning to see for certain. There was a headstone where the departed was to be buried, I was just a bit reluctant to actually go too close out of respect, and maybe a little afraid as well.That's a really awesome frequency graphic you've posted, I've never seen or used that particular program, and I appreciate the analysis of it. Hudds, i agree that it sounds like a "K" name, it almost sound like "Cain" or "Katie" to me.. but yeah, Kevin is right along those lines. Thanks for listening it means a lot to get opinions. Edited by Roxstar, 09 June 2016 - 04:52 PM. It's a pleasure Roxstar, you're welcome to come to me anytime and I will make a point of helping you. I really wanted to see what you wanted sir! Edited by EVP, 09 June 2016 - 04:53 PM. Thanks for such an in depth analysis EVP - I always learn something new from you! Hudds, i agree that it sounds like a "K" name, it almost sound like "Cain" or "Katie" to me.. but yeah, Kevin is right along those lines. Thanks for listening it means a lot to get opinions. I would not entirely dismiss your apparent E.V.P capture as yet, if I were you, until further examination and analysis had been conducted. Consider it as a second opinion, if you prefer. Keep in mind, that a human voice can actually cover a frequency range from 80 Hz to a peak in the 1-3 kHz region. Sometimes it can go slightly higher, yet there's a roll off after the optimum peak, which can be from minus -3 db to -10 db, but it's still can be quite audible. Most of the vocal/ speech low energy is around 125 Hz region, yet the fundamental values of a human speech can range between 250 Hz - 300kz in the lowest frequency region. E.V.P's are captured most of time at the frequency range of either above, or below a humans fundamental voice frequency range. E.V.P frequency ranges are around 200 Hz or lower to 5khz and higher. Which means that an E.V.P can sometimes fall into the frequency range of a human voice/ speech or closer, and also considering the roll off after the optimum peak. Your apparent E.V.P, contained a kind of drastic change in the noise floor before the apparent entity response, which are signs of an entity manipulating the lower frequencies to communicate. I also heard an minor thump or knock after the apparent entity said "Kevin" which followed by subtle whispering of a few words before the end of clip. And, in my opinion this apparent E.V.P does contain a few signatures of an entity/s communication. I would like to also add, that radio frequency contamination in a recording, would have signs of distortion, increased noise floor and not a clear response as you received/ captured, straight after you spoke. I listened to, and also claims of haunted homes. Unless, I personally conducted recording sessions, or investigated a property. Roxstar, there shouldn't be a reason for you to not accept your recording as an actual E.V.P, if you genuinely conducted the short recording session in the graveyard, and not tampered/ mixed the original which I examined. Edited by Hudds, 10 June 2016 - 12:33 PM. Spirits do manipulate pre-existing audio into distinguishable voices, and sounds mostly by tuning themselves to manipulate low-frequency sound waves as they travel to the recorder's microphone. I think that a good idea to go back soon and confirm the name that is on the headstone, or also maybe check for that location's recent cemetery records for burial grounds. and I also despise those who do for either attention, or some kind of recognition. I am very glad that you are not ruling out your E.V.P capture, and I completely agree, it does seem very coincidental that it happened when it did, especially straight after you comment/documenting, and received a "name". Edited by Hudds, 11 June 2016 - 09:17 AM. I really appreciated you going back there, and doing the research. I agree, a mystery it does remain. But nevertheless, I wouldn't still dismiss your capture for most of the reasons mentioned previously, and also I am very aware that spirits can lie to either deceive or confuse, which also could be the case with your E.V.P. A few years back our team was performing to a large crowd and one of the EVP's we captured clearly said the one word "Christy". Afterwards, I had a woman in the audience come to me and asked where I received that capture. When I told her the name of the abandoned school she became a little choked up. I asked if something was wrong and she told me that she lived right across from the school for over a decade. On either side of the small elementary school were houses and up until 4 years prior, there was a child named "Christy" who lived next door to the school. It could very well be sheer coincidence but I found the correlation rather interesting nonetheless. Many parapsychologist suggest some audio snippets are in fact not by dead but by the living. If you look into the research Raudive, this suggests that he in fact had snippets with similar results. Don't go too crazy in research after the fact Roxstar on origins. Even with legitimate captures we are left with more questions that answers. Everyone's research is different but I still see much of the imprints randomized and applying logic simply doesn't seem to work. I still maintain that your snippet was RWI simply by the patterning in the spectral display. Good luck, I know you love this stuff. Edited by EVP, 13 June 2016 - 03:39 PM. Intriguing story and experience, EVP. So the girl, Christy, as far as you knew was still alive? So if it was directly connected then, it would be very strange indeed!! I will be doing some further investigations, next time will try to bring along another team member and at least one more recorder.. as it always lends a hand to the investigation and presents more potential evidence. That was the first time I have ever used my iPod in a session as well, so i wasn't sure what the result would be. It actually picks up sound pretty well it seems. About the lying/deceiving spirits and voices you mentioned Hudds, yes, I have seen that happen too. Those are the ones, in my opinion, to be weary of. They also can mimic others, I've seen that.